The WOLF is based on the already extremely successful civilian Mercedes railways 250 GD. It was offered to the German Federal Armed Forces in 3 wheelbases, five structure, and 15 conversion kits. This 4-seater proved to be extremely versatile with all the possible configurations. It has a 2.5L engine with an output of about 100HP propelling it to a maximum speed of 123km/h(74mph). This particular model has the KFOR(Kosovo Peacekeeping Forces) scheme. Comes complete with display stand and acrylic case. German model from Y-serie Premium ClassiXXs GmbH. This is a 1/35 Die-cast model of the LKW 0,5 T GL Leight “Wolf”. The model comes in its own display base with clear plastic top. 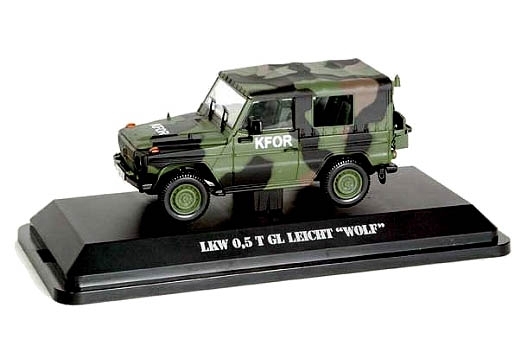 The Wolf GL is a military vehicle from Mercedes-Benz, which is used by the Bundeswehr and is also used by other government organizations. This "third generation" SUV is one of the wheeled vehicles that is a special development model of the Mercedes-Benz G-Class. Vehicles developed from the G-model serve as a transport vehicle of the KSK and the Enoch as a protected vehicle.